The intricate and colourful nebulae are produced by ionised gas  that shines as electrons and positively charged atomic nuclei recombine, emitting a cascade of photons at well defined wavelengths. 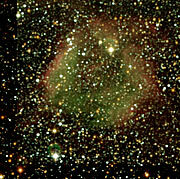 Such nebulae are called "H II regions", signifying ionised hydrogen, i.e. hydrogen atoms that have lost one electron (protons). Their spectra are characterized by emission lines whose relative intensities carry useful information about the composition of the emitting gas, its temperature, as well as the mechanisms that cause the ionisation. Since the wavelengths of these spectral lines correspond to different colours, these alone are already very informative about the physical conditions of the gas. 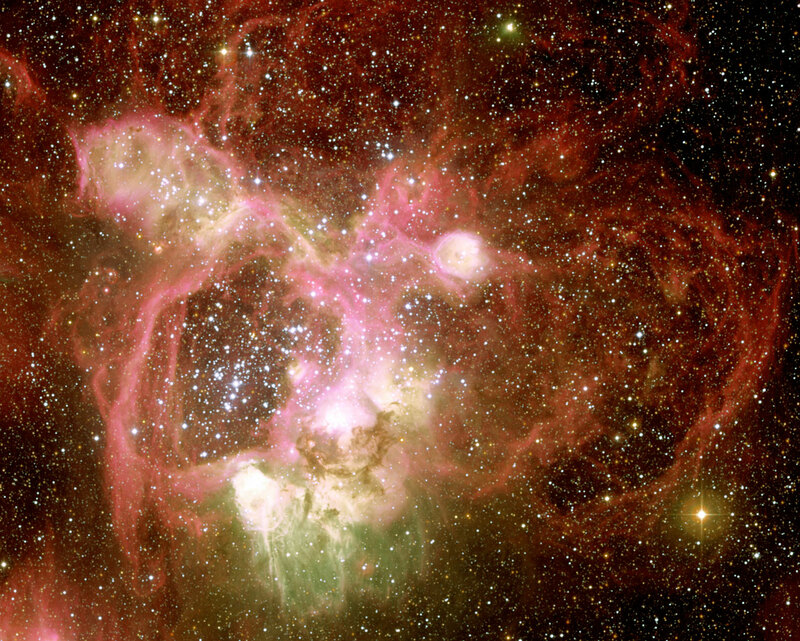 N44  in the Large Magellanic Cloud is a spectacular example of such a giant H II region. 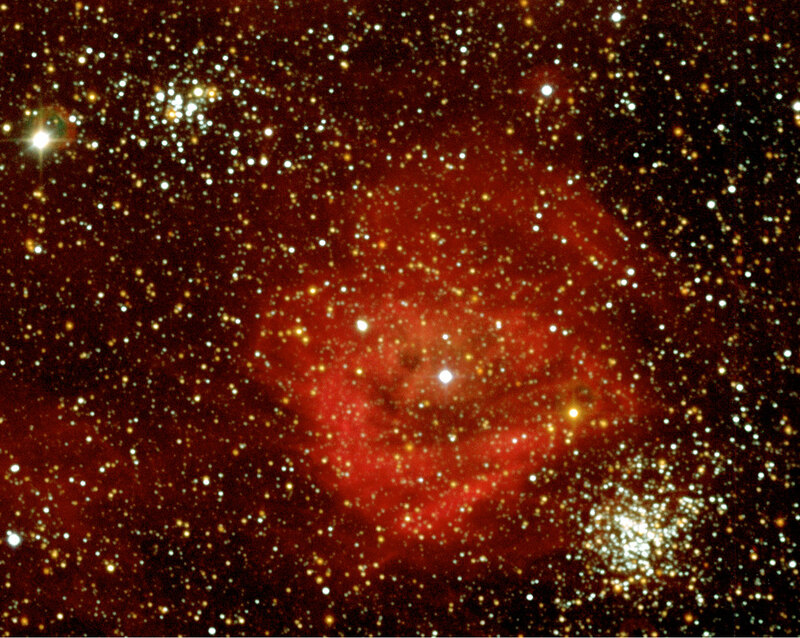 Having observed it in 1999, a team of European astronomers  again used the Wide-Field-Imager (WFI) at the MPG/ESO 2.2-m telescope of the La Silla Observatory, pointing this 67-million pixel digital camera to the same sky region in order to provide another striking - and scientifically extremely rich - image of this complex of nebulae. With a size of roughly 1,000 light-years, the peculiar shape of N44 clearly outlines a ring that includes a bright stellar association of about 40 very luminous and bluish stars. These stars are the origin of powerful "stellar winds" that blow away the surrounding gas, piling it up and creating gigantic interstellar bubbles. Such massive stars end their lives as exploding supernovae that expel their outer layers at high speeds, typically about 10,000 km/sec. It is quite likely that some supernovae have already exploded in N44 during the past few million years, thereby "sweeping" away the surrounding gas. Smaller bubbles, filaments, bright knots, and other structures in the gas together testify to the extremely complex structures in this region, kept in continuous motion by the fast outflows from the most massive stars in the area. The colours reproduced in the new image of N44, shown in ESO Press Photo eso0332a (with smaller fields in more detail in ESO Press Photos eso0332b-e) sample three strong spectral emission lines. The blue colour is mainly contributed by emission from singly-ionised oxygen atoms (shining at the ultraviolet wavelength 372.7 nm), while the green colour comes from doubly-ionised oxygen atoms (wavelength 500.7 nm). The red colour is due to the H-alpha line of hydrogen (wavelength 656.2 nm), emitted when protons and electrons combine to form hydrogen atoms. 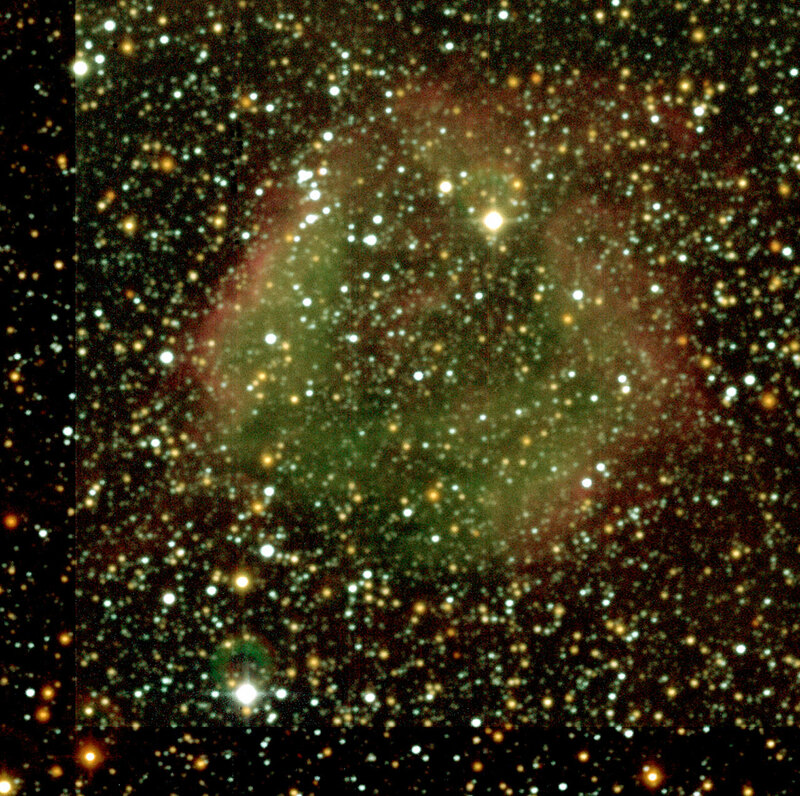 The red colour therefore traces the extremely complex distribution of ionised hydrogen within the nebulae while the difference between the blue and the green colour indicates regions of different temperatures: the hotter the gas, the more doubly-ionised oxygen it contains and, hence, the greener the colour is. However, some regions stand out because of their distinctly greener shade and their high brightness. Each of these regions contains at least one extremely hot star with a temperature somewhere between 30,000 and 70,000 degrees. Its intense ultraviolet radiation heats the surrounding gas to a higher temperature, whereby more oxygen atoms are doubly ionised and the emission of green light is correspondingly stronger, cf. ESO Press Photo eso0332c. By contrast, this image was a three-colour composite produced by means of two broad-band filter exposures in blue and green light and one H-alpha exposure, and therefore outlining the general appearance of the ionised region. Says Fernando Comerón, leader of the team: "Thanks to the use of a UV-filter and two narrow-band filters isolating the emission of specific ions, the new picture provides much more information about the complicated physics of the excited interstellar gas in the region." 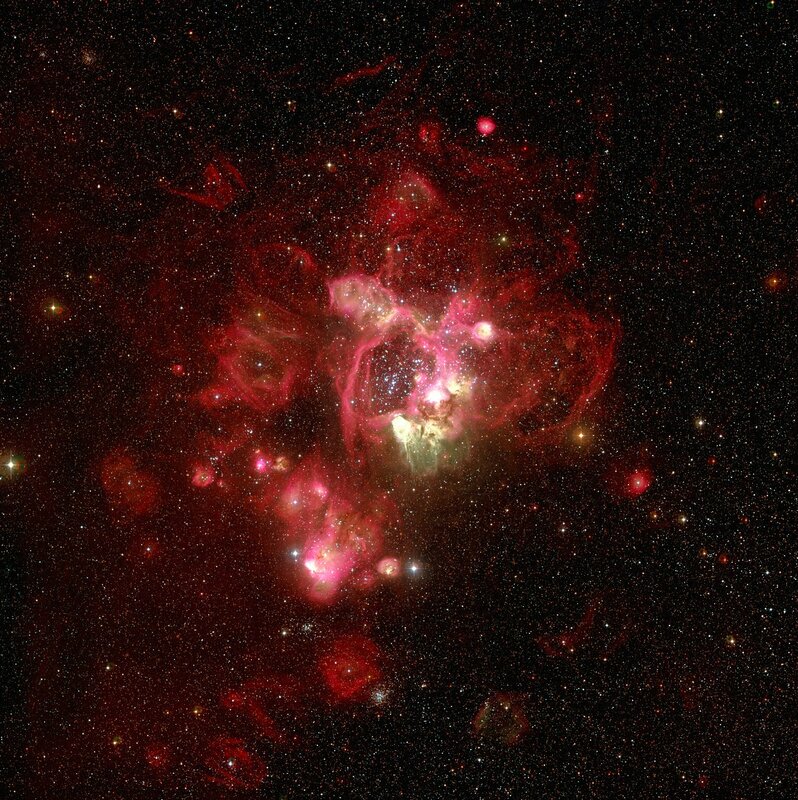 Nausicaa Delmotte, member of the team, adds: "With its colourful beauty, N44 is a display of the violent phenomena that occur as the heaviest known stars unfold their power on the parental gas out of which they were born." A gas is said to be ionised when its atoms have lost one or more electrons - in this case by the action of energetic ultraviolet radiation emitted by very hot and luminous stars close by. The letter "N" (for "Nebula") in the designation of these objects indicates that they were included in the "Catalogue of H-alpha emission stars and nebulae in the Magellanic Clouds" compiled and published in 1956 by American astronomer-astronaut Karl Henize (1926 - 1993). The team is composed of Fernando Comerón and Nausicaa Delmotte from ESO, and Annie Laval from the Observatoire de Marseille (France). 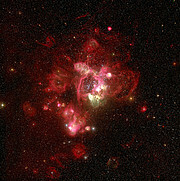 The colour picture of N44 in the LMC is based on three monochromatic images taken on 6 and 7 December 2001 with the Wide-Field-Imager (WFI) at the ESO/MPG 2.2-m telescope, using the U-band filter (containing the forbidden line of singly-ionised oxygen, [OII], at 372.7 nm) and two narrow-band filters centred, respectively, on the wavelengths of the forbidden line of doubly-ionised oxygen ([OIII], at 500.7 nm) and hydrogen (H-alpha line, at 656.2 nm). Each single-colour image is in turn composed of four individual frames of 20 minutes of exposure time each. The WFI detector system is composed of eight individual 2k x 4k CCDs with small gaps between them; for this reason, the individual frames in each filter were obtained with the telescope pointing at slightly different positions in the sky, so that the parts of the sky falling in the detector gaps in any given frame are recorded on the others. 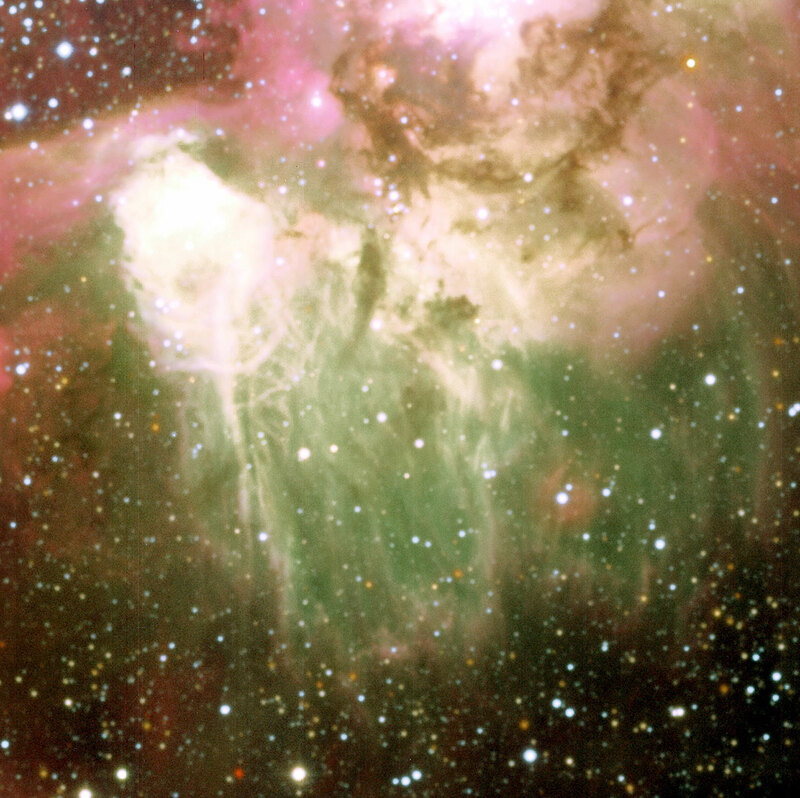 A problem with one of the detector chips causes double stellar images to appear over a small, narrow strip near the upper left edge of the full field image. The monochromatic images were produced by superimposing the individual frames, correcting for the telescope offsets. Finally, the combined images in each filter were aligned and colour-coded to produce the resulting colour picture. North is up and East is left.